"That's not the way Grandma did it," my seven-year-old informed me. "I'm sure you're right honey, but I'm not Grandma," I replied as I tried to pry a cake out of its pan. 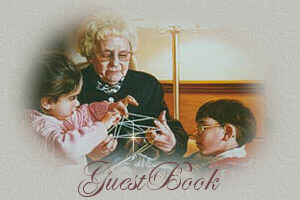 The special bond between Grandma and Emily was unusual because they were not related biologically. Henrietta volunteered to temporarily keep Emily after our regular sitter could no longer work. By the end of their first afternoon together, Henrietta had become "Grandma" and Emily had found her place. During their seven years together, Grandma had helped teach Emily to walk, read, write, ride a bike, cook, climb trees, swim -- the list could go on forever. At times, Henrietta would tell me she felt slightly guilty that Emily enjoyed staying with her so much. It was no secret that Emily preferred to be with Grandma over anyone. 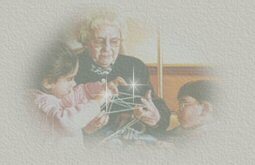 Grandma was a blessing and we were thankful to have her. Then, the unthinkable happened. Grandma suddenly became ill and had to be hospitalized. Initially, the two of them were able to communicate by phone, but as Henrietta became weaker, the conversations came to an end. Emily was lost. She had rarely gone a day without either seeing or talking to Grandma. A few weeks after becoming ill, we got the call in the middle of the night that Grandma had passed away. My husband and I lay awake trying to imagine breaking this news to our daughter. Grandma had been her world for seven years. As I lay there in those early morning hours, I thought back to the last conversation I'd had with Henrietta. I had called the hospital to check on her and was told by her daughter that they'd been trying to reach me. Henrietta had insisted on talking to me and had been becoming increasingly agitated at not being able to speak to me. Her daughter was hoping that after talking to me, Henrietta would finally be able to rest. As Henrietta held the phone, I could hear her labored breathing. "Is my baby ok?" she asked, her voice barely a whisper. "I need to know that she'll be okay." "She will," I said, my own voice now choked with emotion. Within an hour, Henrietta slipped into a coma. Now, as word of her death came, I understood the reason for her agitation. She had needed to hear that her beloved Emily was going to be okay without her. She needed Emily to know how much she loved her. Having done that, she now could rest. Instead, without saying a word, she rolled away from me and faced the wall. I sat with her awhile, hoping she would eventually cry, be angry, anything. Instead, she just stared at the wall. When she did finally emerge from her room, she walked around as if she were in a daze. We went through the motions in the days that followed striving to adjust to a daily routine that no longer involved Grandma. Each time someone would bring up something about Grandma, Emily would quickly change the subject. It was as if just to hear the word "Grandma" was more than she could stand. Now several months after her death, when my cake refused to release itself from the pan, Emily mentioned Grandma. "That's not the way Grandma did it," she repeated. I turned to her and caught sight of a tear before she quickly brushed it away. "I know sweetheart," I sighed. "I can't do it like Grandma, but I bet you can. Why don't you show me how Grandma did it?" I suggested. Emily took the cake pan and gently worked a knife around the edges, just as Grandma had no doubt taught her. The cake easily slid out of the pan. I looked on with tears in my eyes as I realized Emily's healing had finally begun.